Game time! Congrats to Jesse Chong Band, Brackish Water Jamboree, The Fuzz Band, SoPoz, 49 Winchester, Firecracker Jam, Place Called Home, Jason Springs, Travis Elliott, Jouwala Collective, The Judy Chops, and Disco Risque. These talented bands will be going on to perform at the live playoffs at 3 Virginia shows on March 2, 9, and 16. It’s your vote that gets them into the next round (and you must be at the shows to vote), so come out, treat your ears to new and original music, and support our local venues and bands! 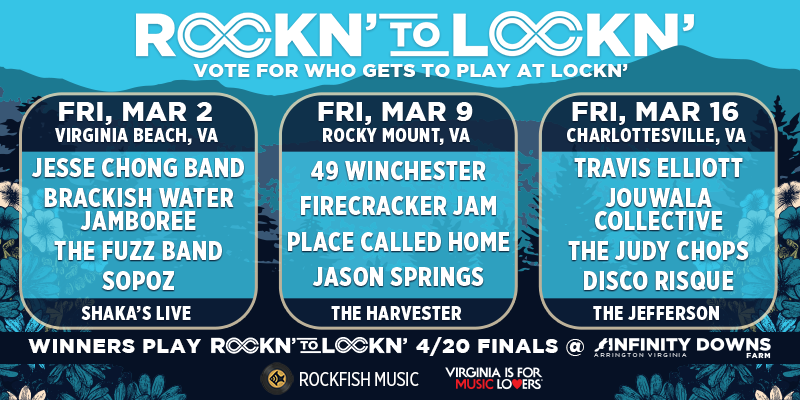 Plus there’s a good chance for you to win some LOCKN’ tickets!